These metabolites produce the symptoms including under absorption and over-production. I don’t find this mechanism plausible. Bad gut bacteria? Just clean it out with an antibiotic, supplement with K2 and butyrate and CFS should be cured. Except it doesn’t work. Reaching for straws. Antibiotics are very selective. You cannot clean them out… a rather naive statement. Many leading European CFS MDs are using Mutaflor, an e.coli probiotic with good results. What an amazing site! I’m obsessively searching the Internet for the puzzle pieces and you’ve put them altogether here. Phoenix Rising is a very good site, but this is amazing. Not enough information to make a fact based conclusion. We do not know how LSD modifies the microbiome. 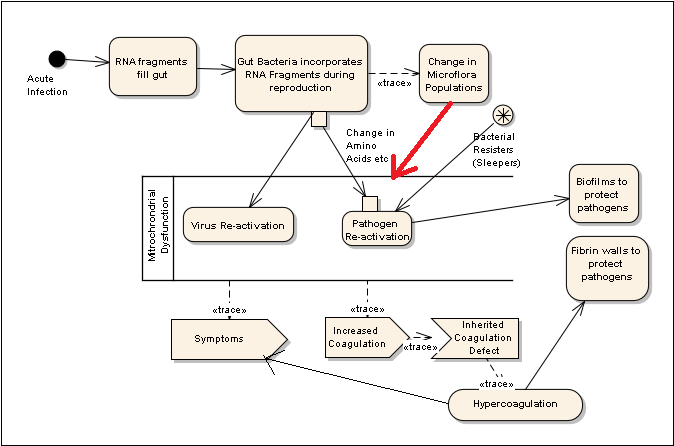 I notice that your earlier site explained the model of disease in CFIDS somewhat differently. The focus there was on a genetic predisposition to a coagulation disorder that once triggered lead to a persistent immune dysfunction that kept coagulant levels high, obstructing small vessels and leading to reduced function in many tissues and all teh symptoms we know of in CFS. 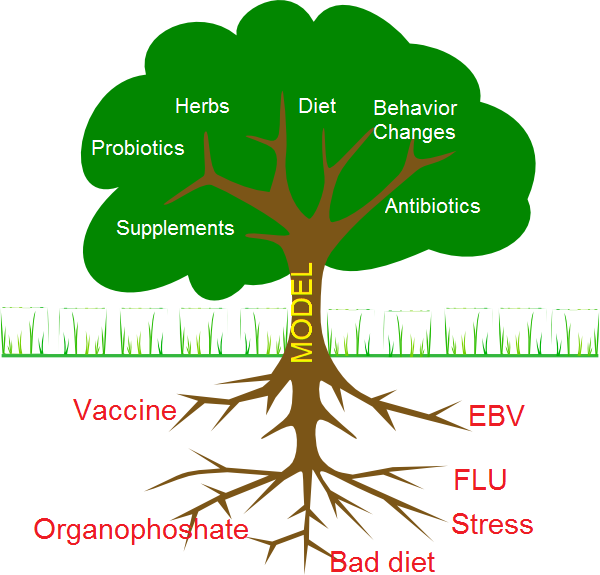 here the model focusses on gut bacteria shifts as the main driver of illness. Could you help us understand the reason for the shift? The main aspect that changed was discarding the notion of a persist but occult/invisible infection (which no one seem to be able to find). The coagulation aspect is still there — but given the challenge that most CFS patients would have in getting that tested, I tend to emphasis the maintainer — the gut bacteria shift. The metabolites likely generates the coagulation (I seem to recall reading something close to a verification of that in a study — I should likely research and do a post on that). OK great! Thank you very much for replying. I will look into this also and post back with anything relevant that I find. These typically do not behave like the acute infections we are more familiar with. – they live mainly inside our cells sheltered from most of the immune system behind the cell membranes. Rather than exposed in the spaces between the cells. – they tend to be slow growing and of low endotoxicity(rather than fast-growing and high pathogenicity) and as a result tend to go unnoticed, at least for a while, but can go on to create long-term chronic effects in the body through hijacking certain chemical pathways for thrown metabolisms or survival benefits. However, there are understandable issues with detection of these small pathogens. For many years the gold standard for detection has been indirect immunological testing (looking for antibodies) but there is now good evidence that these antibodies are often absent or present at levels below the diagnostic threshold of the tests, even in infected individuals. In fact, Bartonella is interesting. He provides compelling evidence that chronic Bartonella infection is, more prevalent than previously thought, causes circulation issues consistent with CFS, especially in small vessels via angiogenesis ( stimulation of new blood vessel production in tissues) causing disruption to flow of nutrients and oxygen to tissues in many organs, including brain, eyes, gut, liver, etc and a very wide accompanying symptom picture. It is also harder than previously thought to irradicate, produces extensive fibrin-based biofilms and highly immunosuppressive, potentially harbpouring secondary infections and is easier to pick up than most zoonosis. e.g. from cat fleas. There is certainly a lot of crossover with what we know of CFS and demonstrates that a pathogen is possible as a trigger and ongoing irritant/suppressor of the immune system. In fact I believe one of your correspondents gained remission but also repeated relapses and was later found to have a rickettsia infection ( a v similar and related organism). He is actually a Doctor or Veterinary Medicine – but then it often takes someone from outside the fold to shine the light in a new direction. The only thing that detracted for me is that he along with a business partner has set up a testing lab for Bartonella testing, so a conflict of interest could be inferred. Seems like a stand-up guy though, has 11 pages of publications on PubMed. As far as I am aware what is known about the mechanisms of the pathology of APS would not easily explain these rashes. Whereas, they do fit with a low-level Bartonella infection (or similar small intracellular organism) acting as a trigger and ongoing maintainer of the hyper coagulation, inflammation etc. further food for thought or simply confirmation bias at work….? Thank you for point this out! I understand, and I think you are right about the gut bacteria being a key part of the puzzle – possibly the major park keeping people ill.
We have tried to treat it similarly to how you describe here, but it either doesn’t go away or goes away and comes back swiftly. So at least in our case, perhaps others, the question remains, what set off this illness in two unrelated and otherwise very fit and healthy people. An infection seems the logical culprit since we both became ill at the same time and we have ruled out most environmental factors. If it was such an infection, could that still be contributing to the stubbornness of the condition? It seems likely to me – not instead of the gut dysbiosis – but as well as. The two can be there. The infection modifies the gut bacteria to feed itself. The modified gut bacteria makes it easier for the infection to persist at a level that the body cannot fully control (i.e. the infection may be very well fed). Yes, I think that’s quite possible. Or, perhaps, if the infection triggers the clotting disorder, then the reduced blood, nutrient, and oxygen flow will limit the gut’s ability to make enough stomach acid, or digestive enzymes and/or culture a healthy balance of microbes. Dysbiosis will then likely follow, leading to gastric symptoms. Immune system dysfunction would likely follow that, especially as gut barrier permeability is likely to increase. This would certainly fit with the chronic fatigue picture. It may also offer an explanation as to why CFS patients typically have so much variation in symptoms day to day and week to week (an odd and notable symptom if it was purely an infectious disease) through daily variation in their diets feeding or suiting the different strains of harmful/beneficial bacteria to greater or lesser extents each day. By the way – I respect the work you have done and I don’t mean to devalue your model – I just mean to add to the discussion to, hopefully, increase understanding, or just spark more connections/ ideas. No problem — being challenged is the only way to improve the model and get deeper insight. Ken – as a follow-up – do you have any references coagulation being triggered or maintained by commensal gut bacteria. I read the links above but found them a little indirect to be very supportive. At this point of time — not any more than above. Hello, I came across your site last night and found the comment above very interesting. It was about discarding the notion of an occult infection that nobody has been able to find. I went down that path for two years reading microbiology textbooks such as Lida Mattman’s Cell Wall Deficient Forms – Stealth Pathogens and doing a version of the Marshall Protocol under supervision of the nurses at Chronic Illness Recovery. Recently I have encountered the work of Grant Genereux @ ggenereux.blog and find that it satisfies my Occams Razor sufficiently to give the Zero Vitamin A diet a try. So far, six weeks into a very low level of Retinol intake, I’ve had positive results. I’m curious if you have considered the idea that subclinical levels of Retinol can act as “phantom infections”, once the liver has reached saturation, and free floating/unbound Retinol and Retinoic Acid are systemically penetrating epithelial tissues, causing toxic effects similar to those of Retinoic Acid in chemotherapy. Thanks in advance for any comments. This was shared recently on PR and it seems to match a lot of what you are saying on this site. Some on PR chose to focus on the protocol but I thought the paper itself had a lot of good information on what is going on with us pwME/CFS. I may even print it out and take it with me when I go to see my new doctor this year.